The 898c SI Combo features a brilliant color, ultra-high resolution 480V x 800H 7" display, Side Imaging and DualBeam PLUS sonar with 4000 Watts PTP power output, GPS Chartplotting with built-in ContourXD mapping, and advanced Fishing System capabilities. In addition, it includes dual card slots for maps and saving waypoints, as well as 3 programmable preset buttons to save your favorite views. 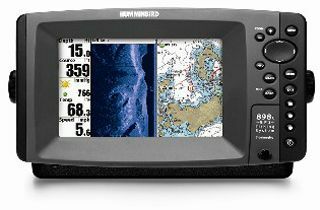 Maximize your angling experience with the Humminbird 898c SI Combo fishfinder GPS system.